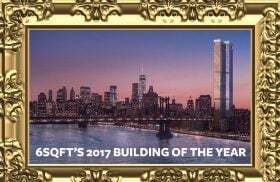 Announcing 6sqft’s 2017 Building of the Year! The votes have been tallied, and so it’s time to name the 2017 Building of the Year! The winning title belongs to no other than One Manhattan Square, the Lower East Side meets Chinatown skyscraper that will be home to NYC’s largest outdoor private garden when it opens next year. The 800-foot-tall tower beat out 11 other significant NYC buildings in a competitive two-week competition held by 6sqft. Out of 3,782 votes cast, the Extell-developed, Adamson Associates-designed structure took first place with 959 votes or 25.35% of the total. More on this year’s winner! Two Bridges, the area on the border of the Lower East Side and Chinatown, is seeing a wave of new, sky-high development, including a 900-foot tower from supertall team JDS and SHoP Architects and perhaps two 50-story buildings from L+M Partners. 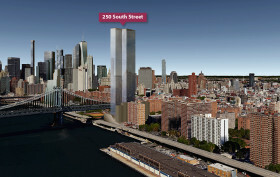 But the controversial surge in construction started with One Manhattan Square, an 823-foot tower from Extell. In anticipation of the 80-story condo building hitting the market this September, the developer has released a flashy new video that shows the sparkling Adamson Associates Architects-designed exterior, as well as the sweeping views from the upper floors. But as Curbed, who first spotted the video, notes, it ignores its potential supertall neighbors to make a point of just how much much it towers over its surroundings.